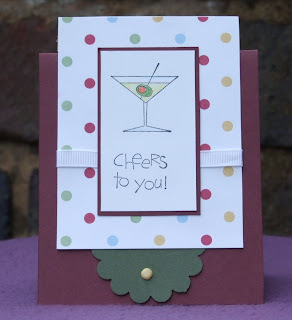 Cheers to You is a really lovely set and I could almost taste the strawberry daquari as I was stamping and colouring these! The papers are Petals and Paisleys and the card is Cable Green and Pixie Pink with Certainly Celery 1/4 inch Ribbon to finish. 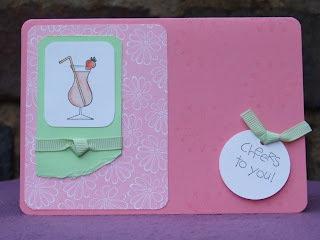 I have used a flower stamp on the background card with versamark although it doesn't show up particularly well in the picture. The one I used was from the In the Spotlight Hostess set but really any would suffice as it is purely to add texture. And Look a BOYS card - how often does that happen then! Not very often for me - Well I like the pretty things in life!!! 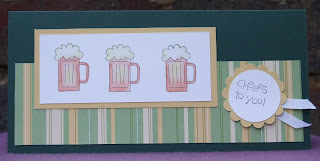 This one uses the same papers and Handsome Hunter for the card base and So Saffron for the matts and scalloped shape. With a snip of Whisper White grossgrain 1/4 inch to finish - yes I make boy cards with flowers and ribbons!!! Using Bravo Burgundy Card stock and Cutie Pie Papers for matting and layering, then hunter green for the scallop shape at the bottom and a So Saffron Brad and slither of Whisper White Grossgrain 1/4 inch to finish. All the images on this page were coloured using Pencils and Odourless White Spirit to blend the colours and I am really pleased with the effect - this was my first attempt at this technique and I much prefer it to straight pencils. It is easier to control than watercolour as well. 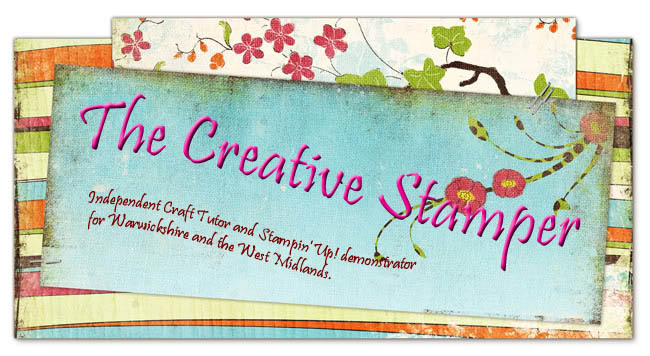 These are very simple stamps that can be used in a variety of ways but I think they look best lightly coloured. Next we have a....well I am not sure but it has fruit and an umbrella so it has got to be impressive ....right??? This card is on the Handsome Hunter again and uses the Cutie Pie papers in a gorgeous blue and green spots and flowers design. This paper set is just so versatile and has so many colour ways it is hard to find something that won't match! Matting with Cable green and then some Certainly Celery 5/8 Grossgrain ribbon and matching buttons from the Rich Regals button set. 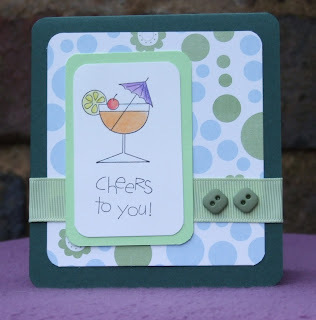 I used the corner rounder punch on all the layers and the card itself for a really cute finished look for this tiny card. 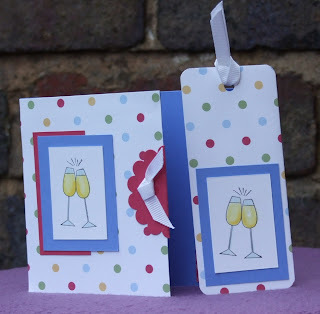 Finally a little card and gift tag set. The card base is Ballet blue along with some of the matting and then some Rose Red card for Matting highlights and the Scallop shape on the edge of the card. Cutie Pie papers for more layers and for the base of the tag - I double folded this so the same paper is back and front) and then some Whisper White Grossgrain in 1/4 inch to finish. I hope you are enjoying all these samples I am doing - I certainly am! 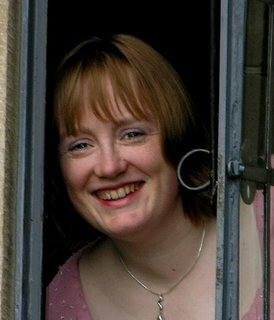 Don't forget if you are interested in a Catalogue or hosting a Party, please get in touch (top right of blog) and I will be more than happy to chat further to answer questions you may have. It's great to see what other people are making with this set. It's a really fun set - and your cards are great fun, too. ohh I love these! You do very well! Keep it up!